At the victory podium during the 2020 Tokyo Olympics, world’s best athletes will be awarded medals made out of recycled e-waste. 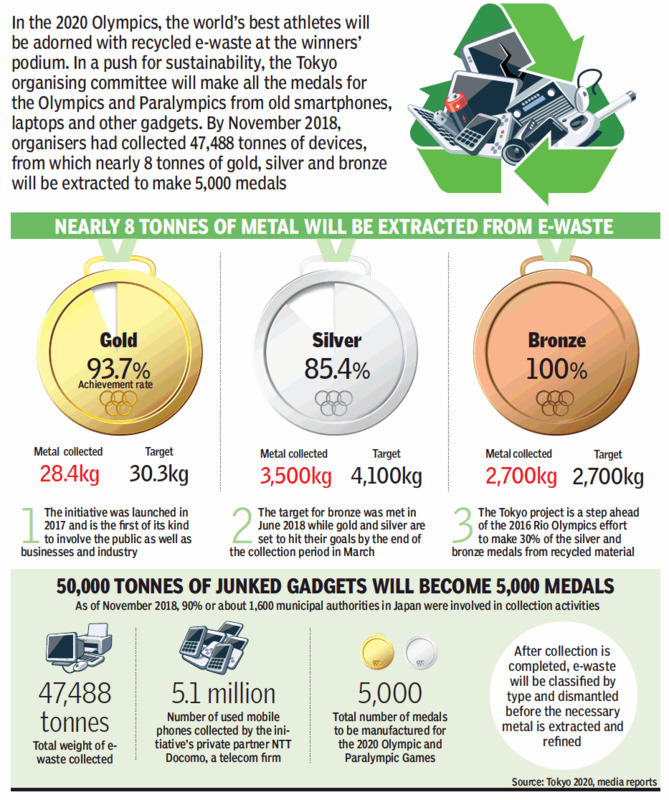 In a push for sustainability, the organising committee will make all the medals for the Olympics and Paralympics from old smartphones, laptops and other gadgets. The initiative was launched in 2017 and is the first of its kind to involve the public as well as businesses and industry. It is a step ahead of the 2016 Rio Olympics’ effort to make 30 percent of the silver and bronze medals from recycled material. By November 2018, the organisers had collected 47,488 tonnes of devices, from which nearly 8 tonnes of gold, silver and bronze will be extracted to make medals. The target for bronze was met in June 2018, while gold and silver are set to hit their goals by the end of the collection period in March. As of November 2018, 90 percent of about 1600 municipal authorities in Japan were involved in collection activities. After collection is completed, the e-waste will be classified by type and dismantled before the necessary medal is extracted and refined. In terms of numbers, 5.1 million used mobile phones have been collected by the initiative’s private partner, which is a telecom firm, and in total 5,000 medals will be manufactured for the Olympics and Paralympics.